Quikr has acquired the real estate portal CommonFloor. The two companies were in talk for the last 6-7 months. This merge came just four months later Quikr launched its own home search business, QuikrHomes. Quikr has so far raised US$346 million from 10 investors, including Tiger Global, Matrix Partners, Warburg Pincus, and Norwest Venture Partners. Quikr, founded in Mumbai by Pranay Chulet and Jiby Thomas, started as a classifieds portal in Mumbai and then shifted its head office to Bangalore in December 2014. It entered high value verticals like automobiles (QuikrCars) and real estate (QuikrHomes) last year after a whopping US$150 million funding round. After the acquisition, the company said the two brands will operate independently, while benefitting from each other. The merger is expected to be completed over the next two to three months. 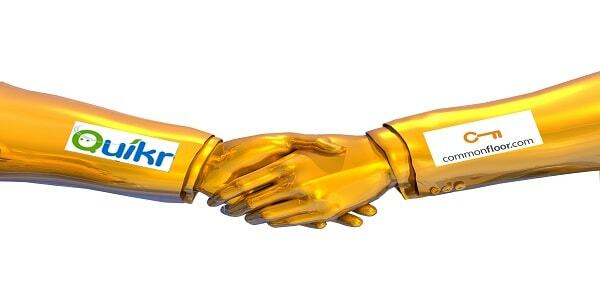 This move will be interesting to look for in the digital industry and side by side it will give CommonFloor access to Quikr’s 30 million consumers and harness the potential of the cross category nature of the platform, while Quikr-Homes will benefit from CommonFloor’s structured data and domain expertise,” Quikr said in a joint statement.